Why use Compression Bags, or Space Bags? Packing Cubes vs. Compression Bags: Which is Right for You? In fact, my shiny new Tortuga packing cubes got more likes and messages than every cute puppy photo I’ve ever shared. This fanfare made me feel like I had just entered a secret, in-the-know club of savvy packers. But it was also an “ah-ha” moment. While I’ve traveled with compression bags, or space bags, on long bike tours, packing cubes were a first. I’d always thought of them as similar, but it was on this trip I learned they help me pack better in considerably different ways. So, what, exactly, is the difference between packing cubes and compression bags or space bags? And which one makes the most sense for you to use? Take it from someone who has tested both in the wild and read on to see how they differ, the best ways to use them, and — ultimately — if you should reach for a set of packing cubes like Tortuga’s Outbreaker Packing Cubes or a compression bag like Eagle Creek’s. Packing cubes are rectangular bags made of sturdy fabric that unzip on three sides, kind of like a mini suitcase. “Think of a packing cube as a dresser drawer in your carry on. Each cube holds similar items to make packing — and finding stuff on the road — easier,” says Tortuga writer Laura Lopoch. Travelers primarily use them to pack and organize clothing before placing them inside their backpack or suitcase. Usually, you can buy packing cubes as a set. The best ones will have a couple of different sizes, handles, and let you see what’s inside without opening them up again. When not in use, they fold down flat and store easily in your closet. Specifically clothing. Group similar items together (i.e. one bag for undergarments, one for tops, and one for bottoms) so you always know where to find things when you need them. With packing cubes, your carefully folded or rolled clothing are less likely to come undone and get wrinkled. Little things, like socks, tank-tops, or your last clean pair of undies, are less likely to disappear mid-trip. When using packing cubes, it’s a lot easier to take out what you need for one night without having to unpack or rummage through the rest. 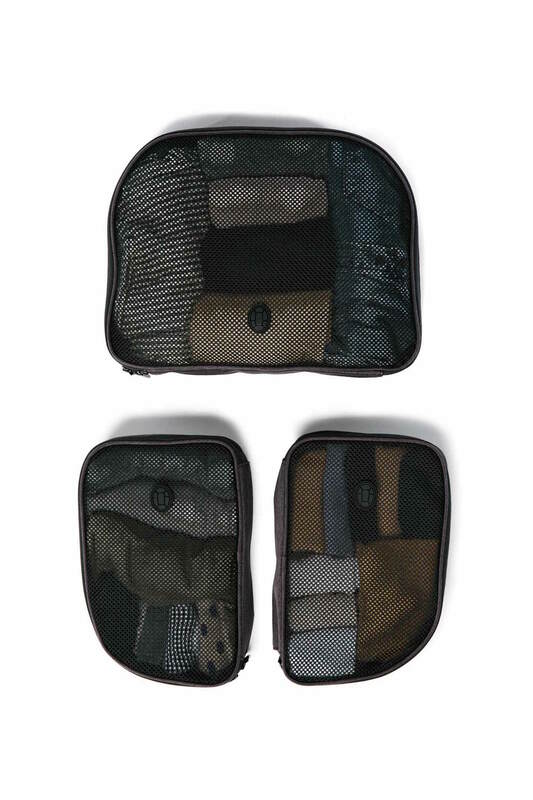 To use your packing cubes, first group your clothes together and designate a bag for each grouping. Next, roll, don’t fold, your clothes so you can easily see everything in each cube. Like you would your luggage, avoid under or overfilling the cubes. If you end up with a half empty cube, try consolidating. Finally, put the cubes in your backpack or suitcase and make it a game of tetris. Stack them in an efficient way to eliminate unusable space in your bag. To avoid overpacking, buy a set of three to four packing cubes (one or two large and two smaller). While some sets come with more, carry on only packers will rarely need more than four. As mentioned earlier, you’ll want to look for cubes with a durable fabric, ability to see inside, and handles. Well-made, and built to last, Tortuga’s packing cubes have everything you need in one. They have zippers that don’t break, a mesh top, handles, and are made from a lightweight but sturdy fabric. I especially love being able to see into the bags when they’re closed (since I always forget where I put what). As part of Tortuga’s line of gear, they fit perfectly into both of the Outbreaker travel backpacks. However, I also tested them out in my 25L Osprey on a quick trip and was happily surprised by how well they fit in there too. The whole point of packing cubes is that they maximize the organization of your bag. To do that, they have to fit perfectly. That’s one reason that the mass market packing cubes are such a dissapointment. They never quite fit and there is always wasted space. Similar to packing cubes, compression bags and sacks are bags you put into other bags. Unlike packing cubes, they’re less rigid and mainly function as a way to squish everything inside into a smaller, more compact parcel. They often lack the organization functionality of packing cubes and, therefore, are less useful for organizing your bag and more useful for fitting more in a small space. Compression bags are confusing, though, because the two main types, home storage compression bags and travel compression bags, are not the same. Home storage ones are often much larger than what you need for travel and not well designed to compress without a vacuum. Avoid these. (Googling around? Search “travel compression packing bags” or “compression bags for travel”). Both are thin, lightweight, sturdy, and designed to use on the road (sans vacuum). This allows you to fit more in your bag — just don’t use this as an excuse to pack more than you need! If you’re trying to transition from checking luggage to traveling carry on only, compression bags can help you get there by packing the same amount of stuff in a smaller bag. Stick your dirties in an airtight compression sack to keep them from stinking up the rest of your bag. To use a traditional travel compression bag (the ones that look like a giant ziploc bag), fold, don’t roll, your clothes and fill it up. Before sealing, roll the bag like a giant tube of toothpaste to get all the air out of it. Then, seal, flatten, and pack away. To clean them, wash with dish soap and a sponge. For compression sacks (the kind that look like a sleeping bag sack), you can roll or fold your clothes before packing them inside. Then, tug the straps on the outside to shrink down the pack. To clean these, you should be able to toss them in the wash but check brand-specific specs first. If you use compression bags, you may find your clothes wrinkling more. To solve for this, carry a small bottle of wrinkle releaser ($2). Another trick: hang your outfit in the bathroom while you shower to “steam iron” your clothes. 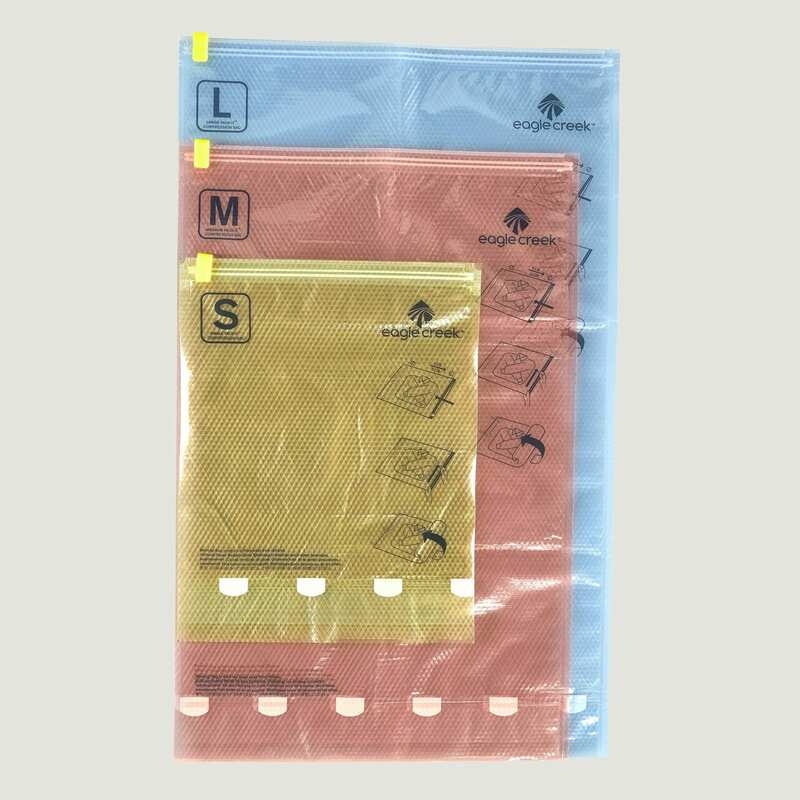 When choosing a compression bag, you’ll first have to choose between a plastic compression bag or a nylon stuff-sack type. Loosely, plastic compression bags fit better in square luggage (i.e. suitcases or your Tortuga travel backpack) and stuff-sack types are better for traditional, top-down backpacks. Either work for duffles. Eagle Creek’s line of compression bags aren’t too dissimilar from a giant sandwich bag, with a clip to close the opening. Designed for travel, the bag can be manually compressed by rolling and squeezing the air out. These get the job done but just be careful not to overstuff them or you may run into issues. 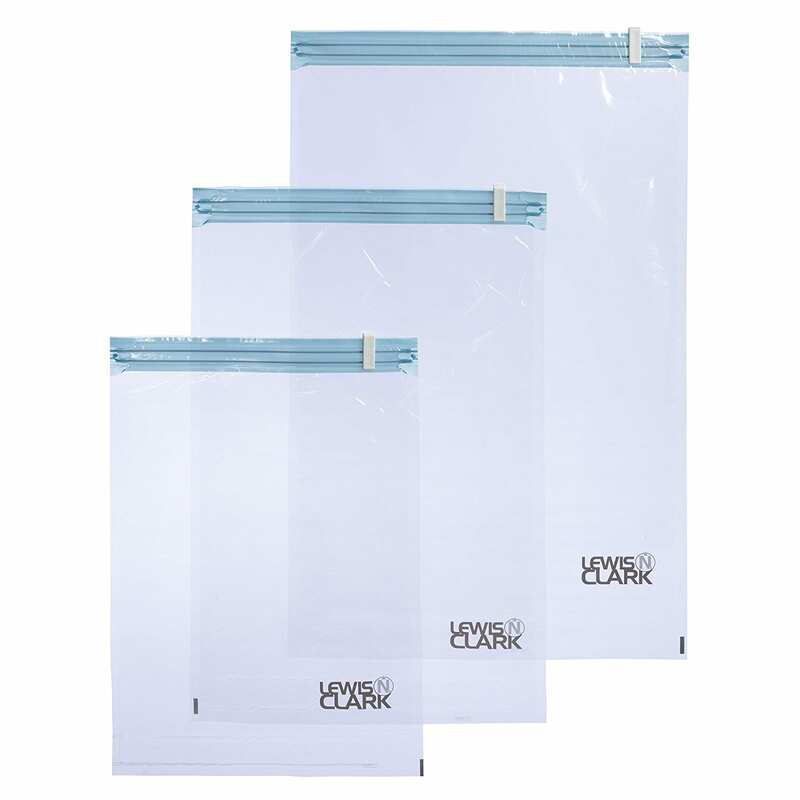 Like Eagle Creek, The Lewis N. Clark travel compression bags are the giant plastic variety that you manually roll and squeeze the air out of. Overall, they’re a decent, cheap option but take a bit of work to actually get all of that air out (you have to roll it twice) and the clip is easy to lose. Gobi Gear’s SegSac is an innovative product that seeks to solve the “compression bag or packing cube?” dilemma. 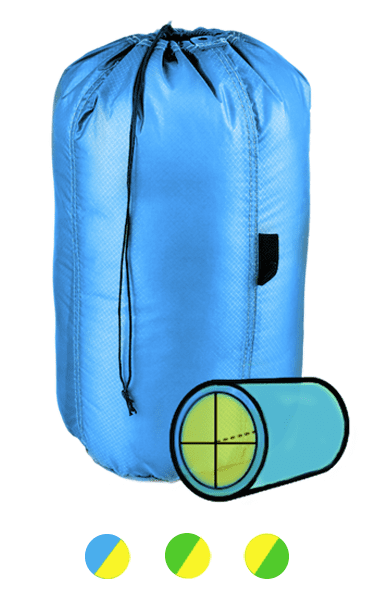 Built out of sturdy nylon fabric, the bag compresses down by pulling external straps like a camping stuff sack. Unlike a traditional stuff sack, though, it has four compartments on the inside so you can better organize what’s inside. Overall, I love this option because it’s one of the few products that organizes and compresses. Plus, their 15L option is a good size for packing light. Unfortunately, it doesn’t fit as nicely as a traditional packing cube or ziploc-style compression bag in a suitcase or square backpack. Reviewers have also said older models didn’t stay closed well — though their newest version seems to have solved for this. I’ve been a fan of the Sea to Summit line of stuff sacks for years and use them frequently for travel, bike touring, and camping. When it comes time to squish clothes in a bag, though, the Ultra-Sil® Compression Sack is the best Sea to Summit bag for the job. Unlike drawstring stuff sacks, they have straps connecting the top and bottom which makes it easier to compress the bag and keep it closed. Also, they’re waterproof, durable, and come in several sizes and colors. Jenn, the Editor of Packsmith has had her Sea to Summit Ultra-Sil® for a decade and has used it hard across six continents. It holds up. Note: I wouldn’t recommend the Ziploc Space Bags for travel. Although they have a travel version, they mostly fall in the “home storage” category and other brands have better-designed bags for travel. Help keep your luggage organized by grouping similar items together, are lightweight, and simple to use. 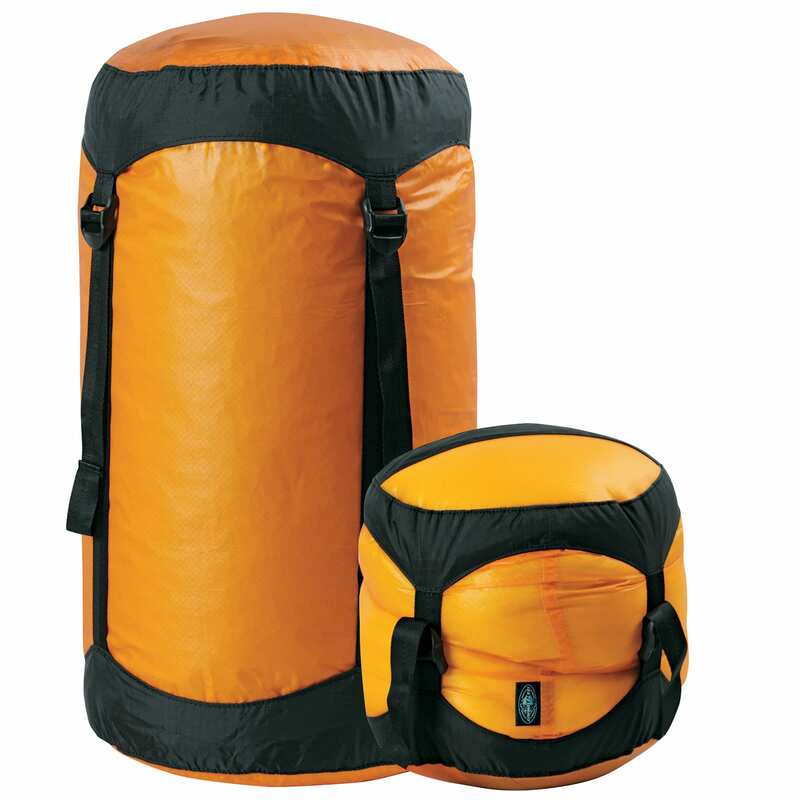 Packing cubes tend to be more durable than compression bags. They don’t fit as nicely in a traditional backpacking backpack but are more suited for rollerbags or travel backpacks. The Tortuga packing cubes fit perfectly in the Tortuga backpacks. Use packing cubes if you want to keep your bag organized, clothes neatly folded, and avoid rummaging around to find things. They also help you quickly pack and unpack while on the road. 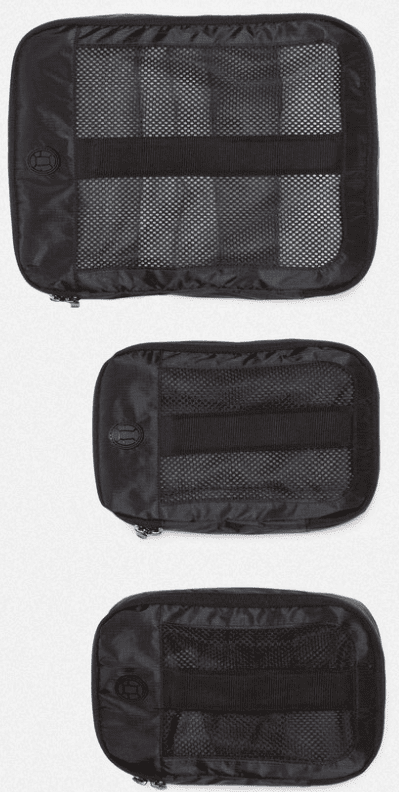 Tortuga packing cubes are a perfect fit in your travel backpack. Help you put more stuff (well, really just clothing) in your bag by compressing excess bulk. Compression bags also tend to be cheaper than packing cubes. Clothing gets more easily wrinkled and most compression bags or sacks don’t have compartments to help with organization. Also avoid home storage compression bags and look for travel specific ones. Use compression bags if you’re traveling with bulky clothes and want them to take up less room in your bag. They’re especially useful for trips across vastly different climates. Gobi Gear, Eagle Creek, or Sea to Summit all make good compression bags. Compression bags, or space bags, work best for fitting more stuff in your bag or helping you step down to a smaller piece of luggage. At the same time, they don’t usually organize your luggage well and can wrinkle your clothes. 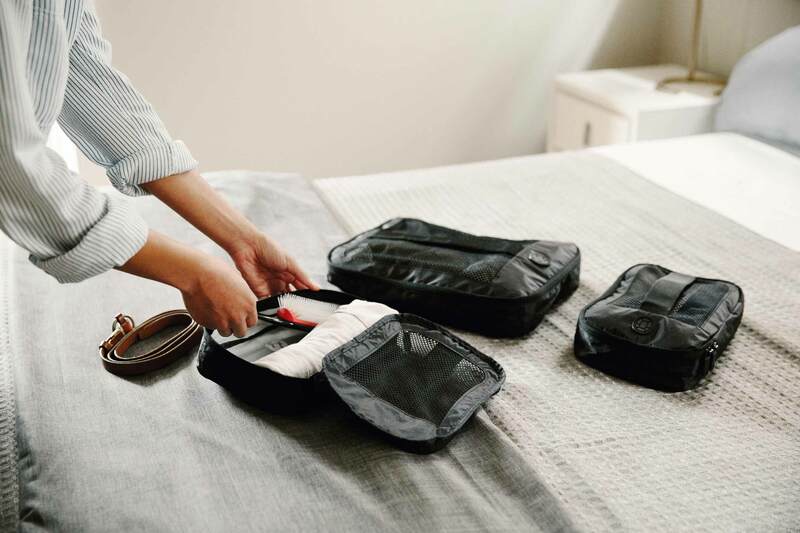 Packing cubes, on the other hand, shine in helping travelers organize luggage, keep clothes neat and unwrinkled, and prevent small items from getting lost (no more socks hiding deep in the crevases of your backpack). They don’t typically shrink down the size of your clothing or help you fit more in your bag. Either way you go, you’ll wonder how you ever traveled without them.